In Arabic, “Zahra” means flower. And like the petals of a flower, the 4 apartments open up inside a historic building of the early 1900s, with a stone "Trapani style" staircase located a few steps from the town's beaches and the fascinating baroque architecture of the historic centre of Trapani. The apartments still retain the ancient majolica tiled floors while the vaulted roofs, from which emerge here and there pre-existing decorations, give that extra touch of style. 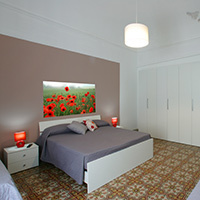 Recently renovated, the apartments range from 40 to 50 square metres sleeping 2/6 guests, to a total capacity of 16 guests. Furnished in a modern style, the apartments consist of a fully equipped kitchen, bathroom with shower, double bedroom with balcony or veranda.The larger apartments (sleeping 5 to 6 guests), also have single beds in the room and a double sofa bed in the kitchen.